Japanese student showcasing all-pink streetwear in Harajuku. Harajuku girl in kawaii pink resale fashion with lace ruffle top, satin pants, fur sandals, and a round paw print purse. Popular Russian model Ellen Sheidlin on the street in Harajuku wearing an all pink look that includes lace-trimmed pants, a corduroy jacket, and cutout platform shoes. Pink haired Harajuku guy wearing a pink graphic tee, cropped pants, polka dot socks, and George Cox creepers. Harajuku girls wearing camisole jumpsuits as part of this summers “lingerie” fashion trend on the streets of Tokyo. Harajuku girl wearing a kawaii pink art t-shirt under a pink hoodie, loose socks, and sandals. Harajuku girl in a cute pink street style with a Neon Moon top, resale jeans, Tokyo Bopper ribbon laced platforms, and a Fancy Surprise bag. 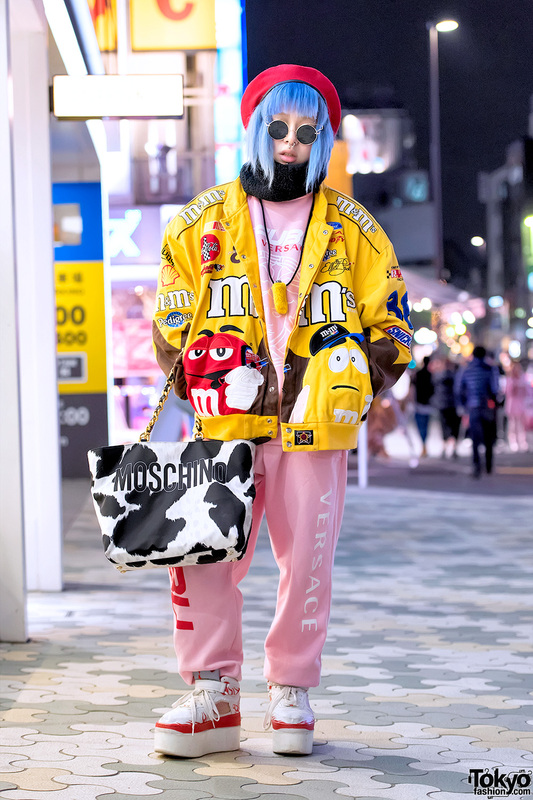 Harajuku guy with blue hair wearing matching pink top and pants from Freak City with a Dog Harajuku bomber jacket and platform sneakers.